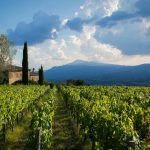 If you are looking at buying a vineyard in Italy then this small wine estate in Tuscany producing around 80,000 bottles of Chianti Classico DOCG and SuperTuscan IGT could fit the bill. Total of 19.7 ha of land, 12.7 ha vineyard and 7 ha olive grove. The wine cellar is working and is equipped with cutting-edge machinery. 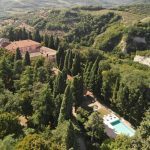 On the Tuscan Chianti Hills in the province of Siena, a short distance from a town with all the services (300m; 2’), the property is located in a hilly position with a beautiful view over the vineyards. 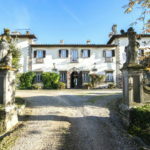 The property includes two main buildings, located a short distance from each other, plus a ruined farmhouse, which could be demolished and rebuilt, among the vineyards. 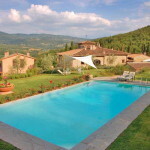 The cellar (478 sqm – 5,143 sqft) is located in the outskirts of a small town, directly above the owned vineyards. On the inside, the building is split into 9 locals on two floors, including the wine-making locals on the ground floor and the business office on the first floor. On the outside, there is also a metal shed (35 sqm – 377 sqft). In the town, there is a farmhouse (362 sqm – 3,895 sqft) laid out on three floors. Currently used as a warehouse for the products, it could easily be converted into a residence thanks to its nice size. An accessory building (ca. 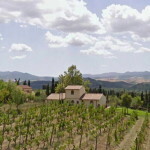 130 sqm – 1,399 sqft) is located among the vineyards but is in bad structural condition. The cellar is currently working and is equipped with cutting-edge machinery. The building is pretty simple, rectangular in shape, and hosts the vinification tanks and the barriques for wine ageing. The farmhouse in the town, conversely, is in builder’s finish and thanks to the excellent temperature of the ground floor and the basement it is currently used as a storage house for wines. The restoration of the building would grand a Tuscan-styled farmhouse with terracotta floors and wooden beams to be used as part of the hosting business. Finally, the building among the vineyards is in precarious conditions and is currently unusable. However, its demolition would allow rebuilding a stone farmhouse (same volume) to be used as a private residence or holiday home rental or further warehousing. The property has a total of 19.7 hectares of land. The olive grove (7 ha) is made up of 1,300 trees and gives a yearly production of around 1,600 litres of extra virgin olive oil. 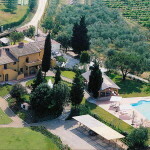 The vineyards (12.7 hectares), mainly registered as Chianti Classico DOCG (9.7 ha). Totally replanted starting in 1993 with a density of 5,000 stumps per hectare, these vineyards give a yearly production ranging around 61,000 Chianti Classico DOCG wine bottles and 19,000 SuperTuscan IGT wine bottles.